Kettle Corn. Um, Kettle YUM. 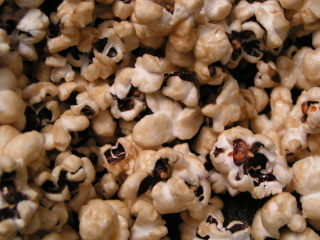 I found this Kettle Corn Recipe on the My Business is to Create blog. No, my popcorn is not burnt. I used black seeds. They make for a tinier, delicate kernel. Yellow would probably be better for this recipe but the empty bowl doesn't care anymore. Next time I will pop less corn so there is more to coat the popcorn. Delicious! Put oil, water, and brown sugar in a small sauce pan. Stir and bring to a boil. Reduce heat to medium and simmer 3 minutes. Remove from heat and pour over the popcorn. Stir very well and salt as normal (important step!). The recipe on the Business blog has more explicit instructions for making popcorn and also includes nice pictures. Thanks for the kettle corn recipe, I don't know why I never thought to use brown sugar. Needless to say my prior attempts at kettle corn where lacking that blend of salty and sweetness.